Rational, the leading provider in hot food preparation equipment, is exhibiting at the Dementia, Care and Nursing Home Expo taking place on 26-27 March 2019, NEC, Birmingham. Visitors to stand D320 will have the opportunity to see a selection of Rational appliances that can provide solutions for the healthcare catering sector. On-hand will be Rational experts who will explain how Rational provides maximum benefit for their kitchens; including space, efficiency and savings, in addition to producing top quality food with consistent results. 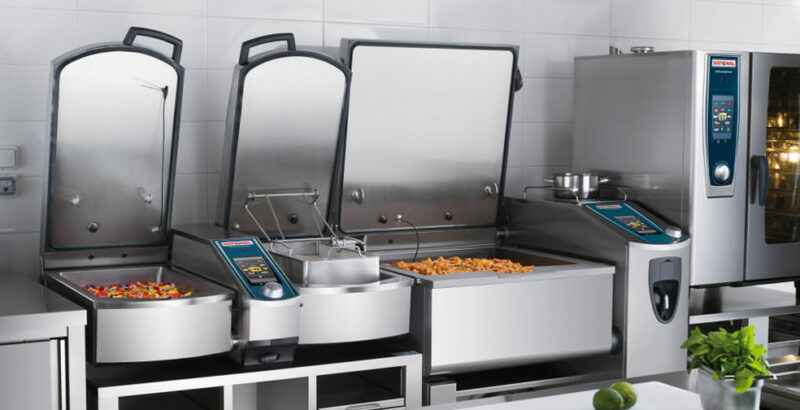 The VarioCookingCenter (VCC) combines the functions of a fryer, kettle, griddle, bratt pan, pressure cooker and tilting pan in one unit, saving up to 30% of space in the kitchen. Its VarioBoost heating technology and the built-in VarioCooking Control improve efficiency, reducing electricity consumption by 40% and water usage by up to 70%, compared to traditional appliances. At the Expo, Rational will be presenting two VCC models, the VCC 112T, a twin-pan, compact unit ideal for smaller kitchens, and the VCC 211+, a single pan unit that can cook up to 300 meals a day. Rational’s market-leading combi oven, the SelfCookingCenter (SCC), is able to roast, grill, bake, steam, stew, poach and blanch food. Its intelligent functions ensure perfect cooking results, reducing staff time and power consumption, while the iLevelControl makes it possible to cook different dishes simultaneously in the same unit. The compact SCC XS model has a footprint of just 0.2m3. Visitors will see the XS Combi-Duo.